Does Gripe Water Really Cure Colic? Gripe water is a homeopathic treatment for colic, a mysterious condition in which a healthy, well-fed baby cries for more than three hours a day for no clear reason. According to the American Academy of Pediatrics, about 20 percent of babies will develop colic, and if your baby is one of them, chances are you’ve considered giving her gripe water. But, what’s in it, how should you use it, and does gripe water really work? Read on for answers. Gripe water is made from sodium bicarbonate along with various soothing herbs, aimed at relieving colic symptoms. 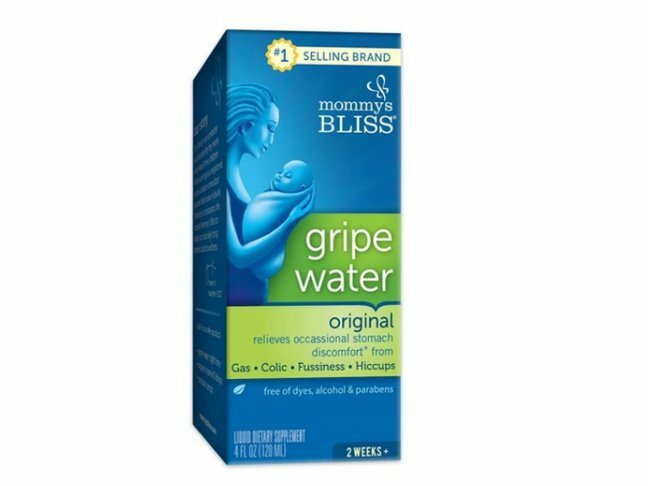 Two of the most popular brands are Mommy’s Bliss gripe water and Little Remedies gripe water. Gripe water is designed to help soothe babies with a variety of ailments that lead to fussiness, crying, and restlessness. While it can help calm infants with colic, it is also designed to be able to relieve symptoms of distress from an upset stomach, gas, and teething. There are several companies that offer gripe water for newborns, and each formula may differ. Generally, it contains water with a variety of herbs. Many organic companies offer all-natural, GMO-free formulas. Avoid a gripe water formula that contains sugar, including sucrose, high-fructose corn syrup, and other sugar derivatives, since those ingredients can lead to tooth decay. You should also avoid any formula that contains alcohol (the original formulas that were created in England contained alcohol for its calming properties), or charcoal, which may be constipating. Once you choose a gripe water formula for your baby, read the instructions. You may be limited to only using the colic treatment to a certain number of times a day or in certain amounts. The instructions may also give you a list of things to look out for as signs that you should stop using it. While many parents swear by gripe water, and it’s a common recommendation from doctors, it doesn’t always work. However, doctors point out that it’s harmless as a treatment even if it doesn’t turn out to be an effective colic remedy. If it is effective, you may have found a treatment that can help your baby with a variety of ailments. Thrush In Babies: What Every Parent Should KnowNewborn Weight Gain: Is Your Baby On The Right Track?